Contact | Jones, Skelton & Hochuli, P.L.C. 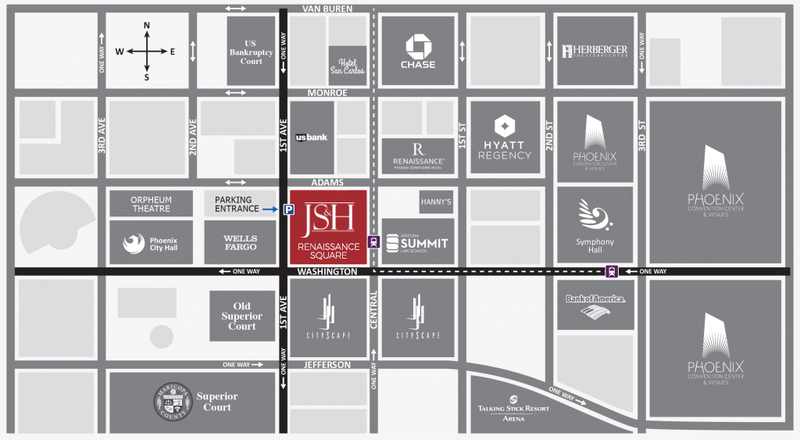 JSH is located in downtown Phoenix near state and federal courts, CityScape, 100+ restaurants and bars, entertainment venues, major league sports arenas, and arts and cultural institutions. Exclusively a trial and appellate defense firm, we represent corporations, self-insureds, governmental entities, and insurance medical malpractice carriers and their insureds. The information contained in this web site has been prepared by Jones, Skelton & Hochuli, P.L.C., for informational purposes only and is not legal advice. It is provided only as general information which may or may not reflect the most current legal developments. This information is not provided in the course of, and receipt of it does not constitute, an attorney-client relationship, and it does not substitute for obtaining legal advice from an attorney licensed in your state. Legal advice should take into account the specific facts of your situation, and you should not draw any particular conclusions from the information presented here. You should seek professional legal counsel before acting upon any of the information contained in this web site. Before sending information to us, however, please speak with one of our lawyers and get authorization to send that information to us. The use of Internet email for confidential or time sensitive information, however, is discouraged, and we request that you first discuss with us by telephone the nature of the information you plan to send by this medium. You must agree to the terms of our disclaimer before submitting this form. Click here to view the contact form disclaimer.